‘Unconventional’ – it’s not pretty, and it works. Start now. | thoughts.are.dots. It’s definitely not safe. It will necessarily be polarizing, and can seem like utter madness. Yet if we take the leap, take it with heart and from a place of respect and curiosity, of service and dignity onto others – remarkable things can happen. This requires us to divorce ourselves from an overwhelming need to be liked. It pushes us toward being OK with living in a certain degree of uncertainty and doubt. It flirts with the possibility of hitting rock bottom. It demands that we stop making excuses and start owning that what we have right now is enough to start. We were lucky to have Mark Brand speak his story at TEDxVancouver 2012 in October. Having lived quite the eclectic story growing up, Mark brought his fire to Vancouver in 2006, and pours everything he’s got into his now soul-home(s) in Gastown. I actually only watched his talk for the first time last week. (Funny how leading the action Front Of House and being so close to the event actually led to my missing out on the very talks that TEDx is all about… But I digress. That’s what labors of love are – sacrifice in service sometimes comes with the territory). Make 17 minutes in your day to watch & listen to Mark’s thoughts and words on “The Impact of an Unconventional Solution”. Listen to what a story of user-centric design and ‘living your work’ can looks like. Listen for the difference dignity makes. Listen to the full story – not just the ‘highlight reel’. Listen for the real. If the incredible souls mentioned in Mark’s talk can do what they do, you can sure as hell do what you’re yearning for. The question is not whether it will be easy. (It won’t be). The question is: is it worth it? 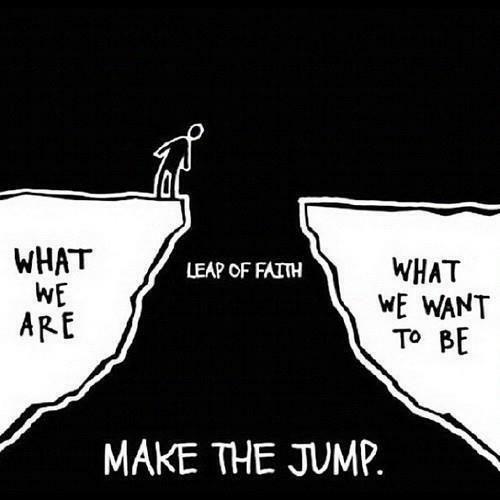 If your answer is “yes!” then I say – whatever that leap looks like for you – do it.